Local Schools are on holiday this week, but last week was surprisingly busy with children from English areas where their holiday was a week earlier than most. Many of them were staying with grandparents who bring them to The Harlequin. Our season carries on, through Halloween, and finishes on Saturday November 3rd. We hope to see many more young friends at our fun-filled family show. 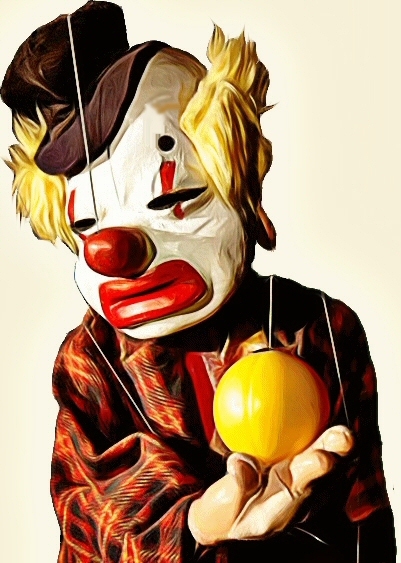 In addition to the whimsical puppet play of The Gooseberry Mandarin we also feature Mr Bimbamboozle’s Magic Tricks which would be quite impossible without the enthusiastic help of the Children. 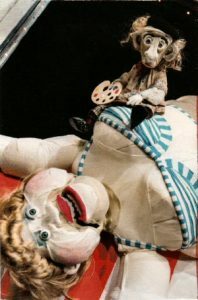 The show always ends with the impressive puppet manipulation featured in Marionette Cabaret. It is an hour and a half of unique entertainment. You just can’t see a show like this not anymore, not anywhere else in Britain. 2018 proved a remarkable summer both for sunshine and for audience numbers at The Harlequin. Rhos-on-Sea’s sandy beach had more families than I’ve seen for several years, and although the sun kept a lot of them on the beach a goodly few came into the shade of the puppet theatre to enjoy our production of “Tales from Alice” being my favourite sequences from Alice in Wonderland and Alice Through the Looking Glass. So a new generation of children met the White Rabbit, the Duchess. the Caterpiller, the Mad Hatter, Cheshire Cat and Humpty Dumpty as well as learning about a Victorian little girl, Alice Lidel, who lived locally and for whom the book was written by Lewis Carrol as a birthday present. 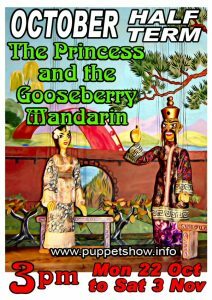 Our nexy opening is for the October Half Term (October 22 to November 3) when we will be showing “The Princess and the Gooseberry Mandarin.” This was Eric Bramall’s favourite puppet play, and it his recorded voice playing the part of the Mandarin. Since this little season spans Halloween we will of course be featuring Mr Scary-Bones the Skeleton in The Marionette Cabaret, the feature which ends every show at the Harlequin. 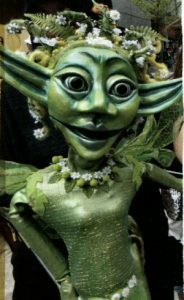 If there has been a favourite puppet with the children over the years, including both boys and girls and even the young ones, it has to be The Skeleton. St Bridgets on the Wirral is a very old church, a Primary School and an enthusiastic Community who every year put on a St Bridgets Summer Fair towards the end of June. 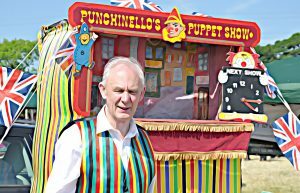 For the past four or five years that I’ve been attending with my Punch & Judy show the event has been blessed with sunshine. It’s a fairly low key event with perhaps only dozen stalls, a bouncy castle and Punch & Judy, a burger barbeque and a stall offering strawberries and cream.. They have a brass band, handbell ringing demonstrations in the church, and Maypole Dancing by children from the school. It is always well supported and is one I look forward to each year. It has a reassuring timeless feel and is not all that different from the Garden Party in the Vicarage garden which I remember as a child, although in those days we didn’t have a brass band, or a Punch & Judy for that matter, but we did have a bran tub! This year the Fair was opened by the Mayor of the Wirral (The Wirral being a Metropolitan Borough I learned). He and the Mayoress stayed for the whole afternoon. 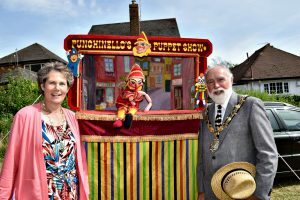 I had just finished my last show and was beginning to pack up when the Mayor’s minder (there must be some official title but I don’t know it) came to ask if Mr Punch was still available for a photograph with the be-chained couple. Of course Punch agreed, well he’s always been a supporter of Civic Authority, and he cheekily asked for a copy of the picture. The Mayoress asked for a business card, so can we look forward to a summons to the Mayor’s Parlour? I’ve just been sent leaflets and brochures to publicize this event but sadly the theatre will not be open until the Summer Holidays so I thought I’d just mention it on here. 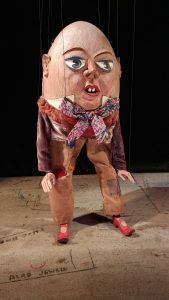 It sounds an exciting event with a lot of puppetry from all over Britain, with 32 ticketed events and 14 free Outdoor Acts. Well the Summer has started with some lovely sunny days. The Caerwys Agricultural Show, which coincided with The Queen’s Official Birthday, was blessed with glorious sunshine. They deserved the good weather since last year’s event suffered the worst weather I have ever experienced for a show. It was so wet and the ground so waterlogged that the cars and trucks were getting bogged down getting on to the showground. It got worse, in fact it rained all day long. So it seemed only fair that they should strike lucky this year. I did three shows during the day with goodly crowds for each. I’ve also been busy in the Harlequin with school shows – two coming from Northern Ireland and a third from the Sheffield area. There are less of these private bookings these days, partly due to the high cost of transport but also to the increasing health and safety complications involved in planning such trips. They usually are older children, around 11 years old, and they make a lovely audience, eager and appreciative. I’ve just taken a break from rehearsing Alice which I am startingearly since as it gets nearer to end of term I’ll have less time due to work in schools. 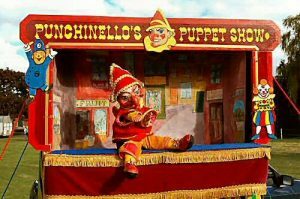 This is when many of the schools book me to visit the school with a puppet themed workshop, usually to fit in with their Seaside topic. Now excuse me, there’s a Duchess and a Cheshire Cat need my attention. The Sun is shining and the Summer is on its way. Yesterday was the last day of the late May Holiday when we presented “A Silly King and the Wrong Wife” and also “The Little Ballet of the Handkerchief Princess” which, together with ourBimbamboozle Magic Tricks and Marionette Cabaret mad for a longer show than usual, almost two hours. Everyone seemed to enjoy the show and I had lots of lovely appreciative comments and some really delightful little helpers with the Magic. I’m now making plans for the Summer Holidays when the feature production will a potpourri of favourite scenes from “Alice in Wonderland” and I’ve sneaked in Humpty Dumpty from “Alice through the Looking Glass”. Perhaps I’ll see some of you over the holiday. I had a delightfully unexpected gift through the post this morning – an exquisite miniature diorama of a beach Punch show constructed in half a walnut shell. I will post a picture but this doesn’t do it justice because the delight comes from appreciating how tiny are the pieces being modelled, positioned and painted. The artist, Ruth Brickland, has a website on which are illustrated a number of her creations. Many are inspired by lives of the saints, children’s literature and so forth, but I spotted Houdini and a Magician producing a Rabbit as being of special interest. Posted on 27th March 2018 27th March 2018 Leave a comment on In a nutshell …….. It was such a great feeling to reopen the Harlequin after so many months. At last the bulk of the renovation after the fire is complete and the Hansel & Gretel production went ahead without problems. Audiences were a healthy size on most days, and even on the couple of days when you were only a few you were an enthusiastic few. Thanks for all the kind remarks and good wishes, and thanks for being patient, and coming back. Next on the books is the Easter Season with Toys on Parade in The Magic Toyshop.